The sun was up early today and seemed a bit angry. Possibly in response to the record snowfall in the Northeast of the USA and many questioning if global warming is real or not? It’s real. Today was the first real day of hot season. The moment I opened at the front door- at just 8:30 a.m., things felt different- just simply felt hot. The days of gentle sweating all day have arrived. To celebrate I decided to spend the majority of the day outside, showing the heat and sun that I will not be defeated. Dehydrated, but not defeated. 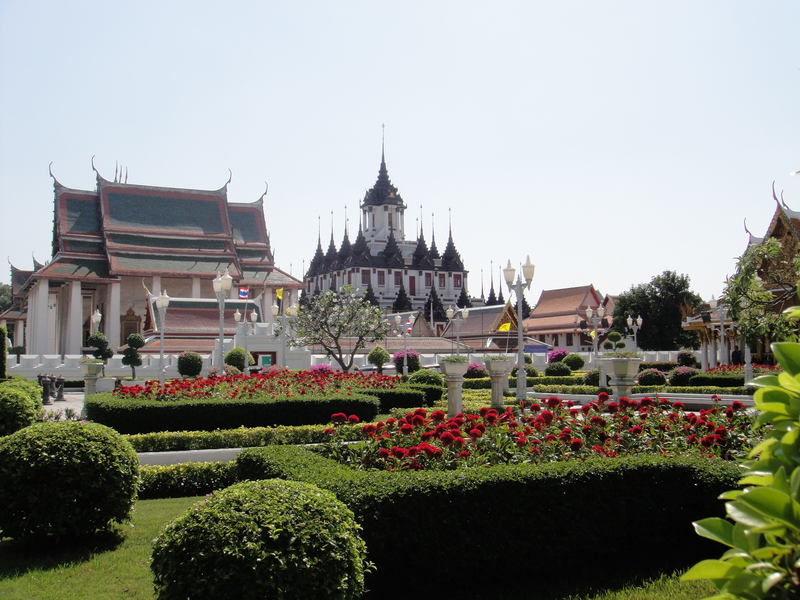 I visited Rama III park and Wat Ratchanadda. 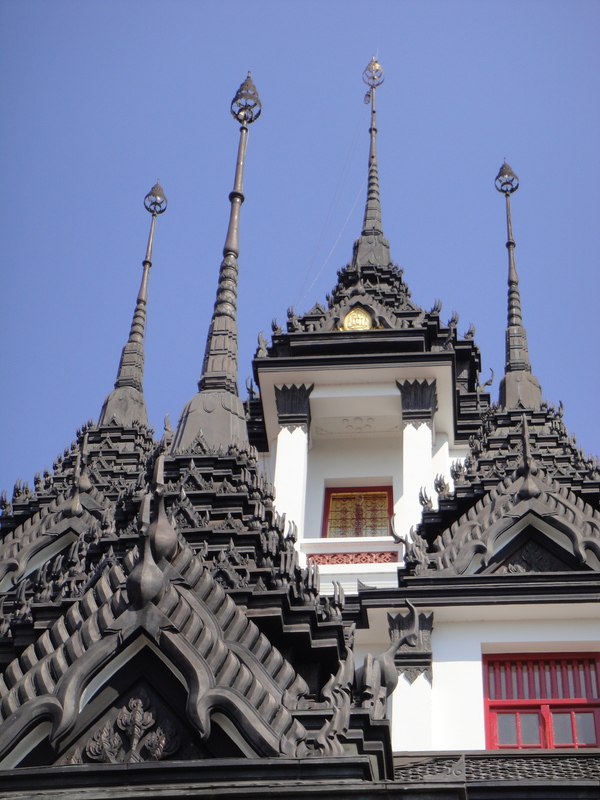 I didn’t go to visit the Wat, but to see Loha Prasat– which translates to Metal Castle. Wow. This is one of the most unique temple structures in Bangkok, completely unlike the brightly colored, ornate temples and spires of the Grand Palace and other Wat’s. It is said Loha Prasat is a copy of an old Sri Lankan structure; King Rama III commissioned it in the 19th century as a gift for his daughter. The Prasat has 5 concentric towers and 37 metal spires, the 37 spires signify the 37 virtues toward enlightenment. It has that muscular design that you see in Prague and Eastern Europe, it is amazing to see this in Thailand. Loha Prasat is a 5 minute walk from the Golden Mount, I highly suggest a visit. There are no crowds and the building is very impressive. I also suggest taking the water taxi- cost is a mere 10 Baht and you avoid all traffic, you also get a look at life along the canal. The water taxi has a stop (the final stop) called Golden Mount. 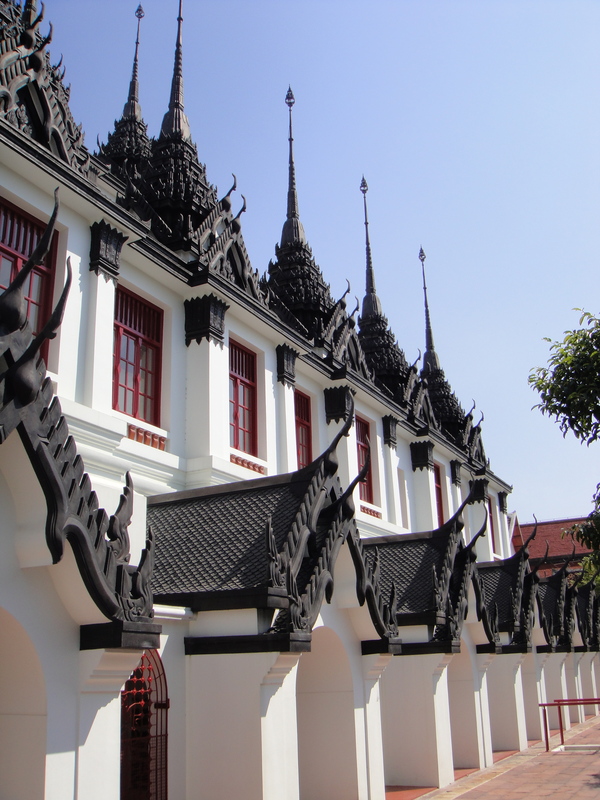 This entry was posted in Bangkok, Landmark, Sightseeing, Thailand, Wat and tagged Loha Prasat, Metal Castle. Bookmark the permalink.